Okay, I’m throwing Sara a fast one because this is not what was planned for today. But I’ve come to realize that Johnny’s garlic bread seasoning isn’t available everywhere. This week, I have literally checked out every store in my area that supposedly carries Johnny’s and no one has it. And as much as I love it, I’m not about to shell out $7 to have a $6 jar of garlic bread seasoning shipped to me (if you’re desperate, you can get it here). 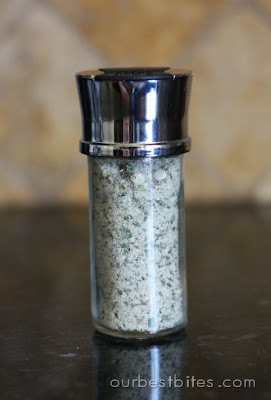 So I decided to make my own DIY garlic bread seasoning and share the recipe with all of you because I’m sure there are plenty of you in the same pickle. Sprinkle on top of breadsticks or combine 1 1/2 Tbsp. seasoning with 1/2 c. of softened real butter and spread on a loaf of French bread (cut in 1/2 lengthwise). Wrap in foil and bake at 375 until butter’s melted. If you want, you could also pop it open-faced under the broiler for a few minutes so it gets brownish and crispy. 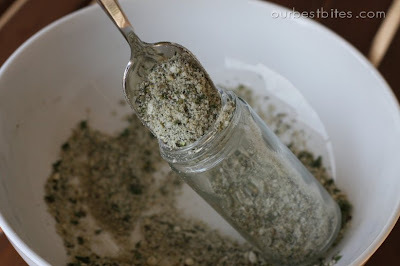 This do-it-yourself garlic bread seasoning is so delicious, you’ll never want to spend your hard-earned cash on store bought ever again! Combine ingredients in a jar (preferably one with a sprinkle top) and shake. Thanks for this. I can’t wait to try it. Now that I have moved back to Utah, I specifically looked up your breadstick recipe so I could find the brand name of the garlic bread seasoning that I have to go purchase (Johnny’s, here I come). I’m sorry you don’t have a Costco Kate. Do you at least have a Sam’s Club??? Thank you for this…do you refrigerate it? I just made this tonight and I messed up the breadstick dough (totally my fault…turned the oven on to warm it up for a second before putting the dough in for the second rise and I forgot I turned it on! Argh! ), but this seasoning was DELICIOUS! Loved it! I love this seasoning and not just on bread. The other day I was cooking salmon. As I was popping the salmon into foil, I decided it needed more than just oil and put this seasoning on top. The salmon was lovely, nice garlicy taste and didn't overpower the salmon. I've tried making stuff like this before, but it's never tasted this good. I realized after making this that it was marjoram I was missing! It's like the "secret" flavor or something. I've been putting this on everything lately- we especially love it on top of pizza. Thanks for the recipe! It's so yummy- I am completely addicted! I can't wait to try it as the secret ingredient in pizza sauce. Has any one tried this with a little rosemary? Rosemary is FANTASTIC on pizzas. Where can I buy powdered parmesan cheese in UT? Oh it's just the grated parmesan cheese??? Sorry I thought it was a spice. Hello! Any suggestions for what I can substitute for the marjoram? I don't have any and don't have to time to get to a store! geegarland- if you're in a major pinch, just leave it out 🙂 But next time you're at the store grab some because it really adds the magical flavor here! Is this Parmesan cheese ok to use? Does this mixture need to be kept in the fridge, because of the cheese? Or am I supposed to have a different type of Parmesan that doesnt need to be kept in the fridge? Sadia- yes, that works great. And it will keep longer if you store it in the fridge. Does it matter if the oregano is ground or leaves? Same for the marjoram . . . I'm making your breadsticks tonight and I can't wait! This is great seasoning! I have made multiple batches over the past few months and have tweaked it to perfectly suit our tastes. It’s such a clever idea. I use it on breadsticks, pizza, have sprinkled it on pasta with butter for a super lazy dinner when I’m too tired to make anything else, and once in a while even for garlic bread. I’ll bet it would be good sprinkled on other things too like broccoli. I love this seasoning and that it keeps in the fridge for months! Oh my gracious!!!!!! Stop the presses!!!! You have outdone yourselves!!!! I’ve had Johnny’s before at my parents house, but I can’t find it here and we don’t have Costco. But ladies… this beats the pants off Johnny’s!!! It is perfection! THANK YOU!!!! I love the ideas about pizza, broccoli, and pasta. Ooooo what about on sauteed shrimp???? YUM!!! I know Emeril has his “essence” but I think this mixture is going to be MY essence! Made this for the first time last week, and mixed it with some butter to slather on Texas Toast – it was SO good, even my super-finicky husband was impressed! No more store-bought pre-made (always disappointing) garlic bread for us!! Increased cheese to 1 cup, added 1 cup mozzerella, 1 stick butter, 1/4 cup mayo and mixed in food procesor until smooth. Slathered pasted on bread and broiled—Amazing cheesey crusted bread. Ohhhhhhh thank you for this…I am in the last couple of TBS of the Johnny’s seasoning and I totally agree on the shipping—Ridiculous!! Besides mashed potatoes and pasta, I use it on shrimp and make tacos with it…My husband loooooves it! I also live in a Costco-deprived zone, so I was looking online to buy it and came across your recipe. Can I tell you how excited I am? This makes the best Ceaser dressing ever! THANKS! This is awesome in your pizza sauce! I was just looking for a recipe for a garlicy/parmesany herbed butter recipe, but I think this might just do the trick. Another winner! you telling me??? we got johnny’s garlic bread seasoning from a friend who lived in north jersey. it was the best i had ever tasted. when i ran out of the darn thing.it was no where to be found!!! it was in a big plastic jar, i hope this will taste the same. i will let you know….by the way???? where do you find “powdered cheese??????? I know, right?! 🙂 Powdered cheese is just the green can of Parmesan you find in the regular aisles of the grocery store (like Kraft), not the actual Parmesan that has to be refrigerated and grated. Made pizza dough, added a bit of oil and sprinkled this over the oil. I added the rest of the mixture to a half tub of cottage cheese and put it over the initial “layer.” Added mozzarella, parmesan, and provolone cheese, baked, and MMMMMMMMmmmmmboy! Cheese pizza heaven! Thanks. Love this seasoning! I just got your cookbook as a gift and I love it! I am a beginner when it comes to cooking, especially when it comes to adding different spices. Ground spices verses dried leaves… does it matter which one I use? I bought ground marjoram and ground oregano for this recipe but noticed you used oregano leaves (after I bought them of course!). Can I still use the ground oregano and if so does it measure differently? We pretty much always use leaves unless we specify that something should be ground. I wouldn’t use ground oregano in this recipe because the flavor can be VERY overwhelming, but if you do, I’d cut it down a LOT. Thank you so so so much for the recipe. I have a recipe using Johnny’s Garlic Spread and Seasoning. I have looked in every store in Broken Arrow, and Tulsa, OK. I can’t find anyone who sells it. I don’t want to order it on line and pay so much in shipping. I am making it tomorrow, to use tomorrow night for my husbands 60th birthday dinner. I can’t wait. Thank you, thank you, thank you for sharing!! This mix is amazing!! I love to use it on bread sticks, but I also use it on pizza crust… brush your unbaked crust with oil then sprinkle on! Smells heavenly!! Oops. I didn’t realize that I was on the seasoning (rather than breadstick) recipe. I love this seasoning on your breadstick recipe. I put it on top of the pizza and around the outside edge of the crust. This seasoning makes everything fabulous! We used this recipe in another recipe for Meatball Casserole that called for the Johnny’s spice stuff. We didn’t have access to that so I searched for a close substitute and found this delightful site! We tried it tonight as a “shake and bake” for chicken and it was soooo much better than any kind of shake and bake that you get in a store. I am going to fiddle with the recipe a little bit and see what adding bread crumbs and a few others things does. Oh, we didn’t have regular parmesan shake cheese so I just used our Parm/Romano/Asiago blend and it was really good. One question: After this set in the fridge for a week (the original recipe we needed it for only called for a tablespoon), it was a tad salty on the kitchen. Any ideas to make it less so? I guess just not adding the salt in the mix? I “stumbled” upon Johnny’s on a clearance rack year’s ago and was an instant fan. Sadly, Costco, Wal-Mart, Vons, Albertsons et al NEVER have the garlic spread on their shelves. I was buying Johnny’s direct from the manufacturer’s website but price/shipping was a big pill to swallow. I can’t wait to test your version and if it’s even a close copy…THANK YOU, THANK YOU, THANK YOU! I tried this and I looooved it, thanks so much for sharing! So, all of the spices are leaves and ground with mortar and pestle? Where did you buy the little spice jar? That’s just from a local craft store- they usually have a good selection of glass jars. This tastes exactly like what you would get at a restaurant! I will never buy frozen premade garlic toast again! Plus my 6yr old helped make it and it was a good lesson on measurements. I’ve used it on almost everything I have cooked since we made it! I have moved to Mexico and of course couldn’t find Johnny’s….a friend here wants to make one of the recipes in my book but Johnny’s was the key seasoning…. This “stuff” is amazing! The options for using it are endless – great in the OBB Pizza Sauce (highly recommend)~ on garlice bread, of course ~ and I like mixing it with a melted butter sauce to pour over cooked pasta. I keep it in my fridge for up to 3 months…if a batch even lasts that long! Thanks for sharing this recipe – so easy to mix up and keep on hand in the fridge. Makes great tasting garlic bread! This stuff is also amazing when put into a chicken salad mixture! This is the “Best” no more frozen bread for us. Added on some smashed potatoes was so- so good ! This is so easy to make and tastes Great. Making another batch tonight for my garlic bread. We quit buying frozen garlic bread after trying this recipe. Also, going to find a spice jar so I can shake the seasoning on easier. 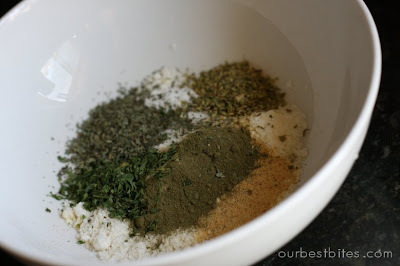 This post came up in my search for a homemade “garlic herb seasoning” spice mix. 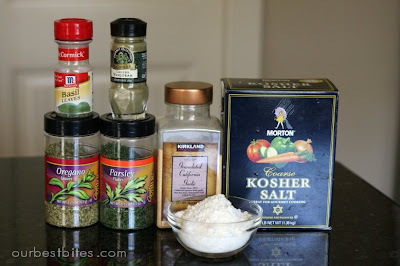 I have a Tilapia recipe calling for Mrs. Dash’s Garlic Herb Seasoning ( http://www.mrsdash.com/products/seasoning-blends/garlic-herb-seasoning-blend ), but I don’t have any and would like to make my own with all the spices I have at home. Do you think this garlic bread mix would serve that same purpose well, for fish…or is this one not really right for that? I’d love your help/feedback. Thanks much & Happy Week! This recipe looks great! I’m hosting a party and making my own garlic bread so I want to try this recipe. I’m making seven loaves of bread. Do you think I would I need to double the seasoning recipe? Found a dry garlic spread at a craft show. It was pricey but good and went along way when mixed with soft butter. It used garlic, sea salt, onion powder and “other spices”. Could never find it again. This fits the bill. Making batches to add to Christmas baskets. Would be great in meat balls also . Thanks, so happy I found it! Excellent! About to make my second batch. I’m single and to keep it fresh I store it in the refrigerator and use to season vegetables, pizza, toast – really anything that needs a flavor punch. Thank you! I’ve been using this stuff for about 2 years now, it is great on a lot of things, garlic bread, chicken, shrimp, asparagus, potatoes, broccoli, cauliflower, and I usually hit my pizza crust with some clarified butter right out of the oven, then sprinkle this around the edge. It’s the only time I ever eat the crust. I have found that my grated Parmesan cheese comes in 8oz shaker bottles, and I measured that out to equal 2 cups, so I quadruple the recipe every time I make it, and it goes back into the original shaker bottle the cheese came in, simple! With all the ingredients combined it makes about 1 and 2/3 shaker bottles, so when I finish one bottle, I keep it, buy another bottle of cheese, and make a batch. This almost fills both bottles, one goes in the refrigerator for immediate use and the other goes into the freezer for later. That rotation works out great for us. Thanks for the recipe.